Earlier this summer, my friend Lynn asked if I would like to try/review Younique Moodstruck 3D Fiber Lashes for the blog, as she was now selling them. I was very interested to give them a try - I love playing with makeup! Though I was not familiar with this product, my daughter was. So of course I let her try them out too! 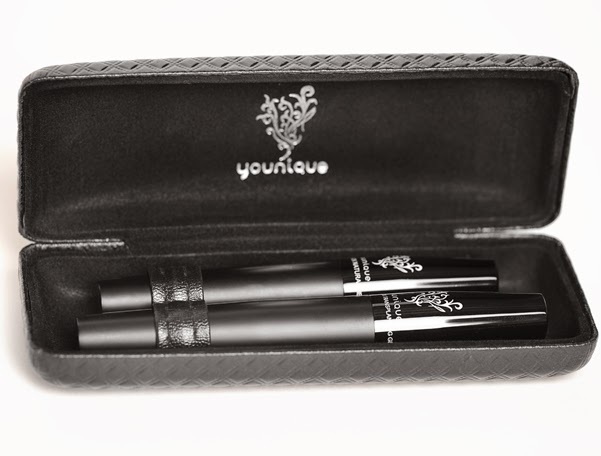 The Younique Moodstruck 3D Fiber Lashes system consists of two tubes in a nice case for your purse. One tube contains the transplanting gel and the other contains the natural fibers. These products work together to enhance and magnify your natural eyelashes. They are water resistant, but easily wash off with water and any eye makeup remover. And they make your eyes POP! They look like you are wearing fake eyelashes,w but without all the fuss! The directions are pretty simple. First you apply your favorite mascara. Let it dry, then apply a thin coat of the transplanting gel. While it is still wet, apply a coat of the fibers. Then apply another coat of the gel to set the fibers. It took me several times to get exactly the right look. The first few time I applied too many fibers and my eyelashes just looked clumpy. Finally figured out that if I did two lighter coats of fibers, each followed by the transplanting gel. That worked better. Also, I have simplified my beauty routine over the last few years, so I no longer have an eyelash curler or comb. I believe those two tools would have made my Younique-enhanced lashes look even better. I'll be purchasing those to add back to my makeup bag so my lashes will look even better. Katie tried Younique on two different occasions when she was at my house. Both times her lashes looked gorgeous! She was blessed with thick, black lashes anyway, but the Younique Moodstruck 3D Fiber Lashes enjanced them in a great way. She only applied the fibers to one eye here so you can see the difference. Pretty amazing, don't you think? As much as I loved trying these Younique lashes, I wouldn't wear these every day, just because makeup isn't an every day thing for me anymore. But I will definitely use them for nights out, or when I have something special going on! They are easy to apply and they really look fabulous. If I still worked outside the home, these would be a must have for my makeup bag! My final recommendation - easy to use, they do what they promise. Younique Moodstruck 3D Fiber Lashes are great, and an affordable splurge for anyone who wants their eyes to look even better! Want to try Younique Moonstruck 3D Fiber Lashes for yourself? Please contact my sweet friend Lynn to try them. She also does Facebook parties if you want to host one and earn free products. Please reach out to her and tell her you saw Younique on Just Kidding Around Atlanta! Disclosure: I received this product for free in order to try it and write this review. No other compensation was received. I keep saying I'm going to try Younique some day but keep forgetting to. I've heard nothing but good reviews about their lashes. I was skeptical myself and waited a few months before trying. After I saw all the pictures I dove right in. Love my lashes now. All the products have a 14 day guarantee. We also have some new products making their debut September 1, featuring eyeliner and lip pencils. Louida, You should give it a try. Let me know of your interested. Our new lip and eyeliners just came out as well as our new eye serum. I'm not a big make up wearer either but when I do it pretty much is mascara this looks really cool! You should give it a try. Let me know of your interested. See how great my lashes look? IKEA 2015 Catalog & $100 gift card giveaway!